I don’t get invited out to San Jose restaurants often, being as I live in the East, rather than South, Bay. But after Golden Garlic reached out to me, I headed to their website, and the pictures convinced me this spot was worth a trip. 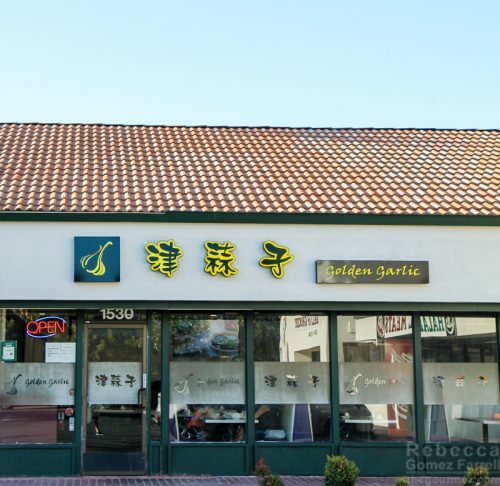 The De Anza location is one of two Golden Garlics opened in the past three years by Eddie Lu. Co-owner and chef David Dai, whom Eddie met while living in China, concentrates on two types of Chinese cuisine, Sichuan and Tianjin. 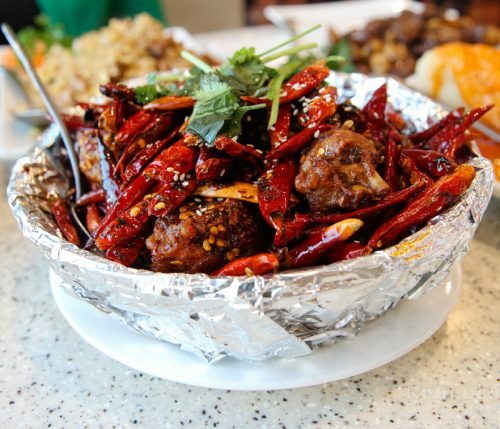 Tianjin is what he knows best, and Golden Garlic can boast of being the first Bay Area restaurant to offer that type of Chinese cuisine. Be sure, if you go, that you ask for the chef’s specialty dishes! I had Eddie on hand to recommend them to me, and you don’t want to miss out on the best this restaurant has to offer. Eddie informed me that an appetizer course in Chinese meals is usually a cold dish, and that sounded perfect at the end of a warm day. One of their house specialties, jelly noodles in chili sauce, came out almost instantaneously. At only $5, this was a steal and a great way to start a meal, especially with that vibrant palette of colors. 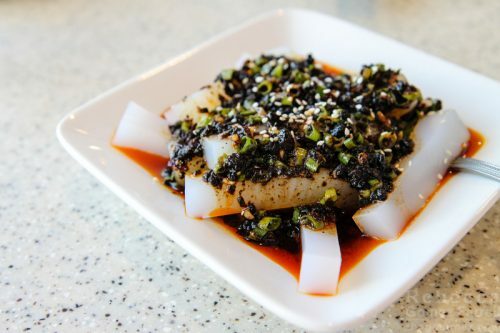 Intense black bean paste and chili oil painted the slightly sweet, blank canvas of rice jelly. The scallions and sesame seeds increased its earthiness. Friend #1 was similar impressed, and although we knew more food was coming, it was hard not to polish it off. All four main dishes also came out lightning fast! In a lesser restaurant, the speed might give reason for pause, but quality was evident in every bite here, so we were just glad at how fast our hunger was satiated. This kitchen obviously understands how to prep food for speedy delivery without sacrificing taste. 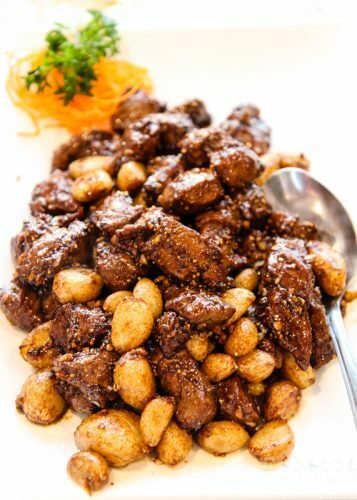 Golden Garlic’s signature dish is Golden Garlic beef, composed of filet mignon chunks and garlic cloves. The garlic is cooked using a secret technique that Chef Dai won’t even share with Eddie. It results in cloves that have the crunch of water chestnuts and a pungency that doesn’t linger past the meal. The filet mignon was tender and juicy and the sauce lively with black pepper primacy but enough sweetness to temper the heat. Delicious, and Friend #1 loved it even more than I did. Another dish unique to the restaurant is tomato-glazed crispy fish. I’m still puzzling over how little it tasted of tomato, instead giving off an apricot-like citrus with plenty of tang. 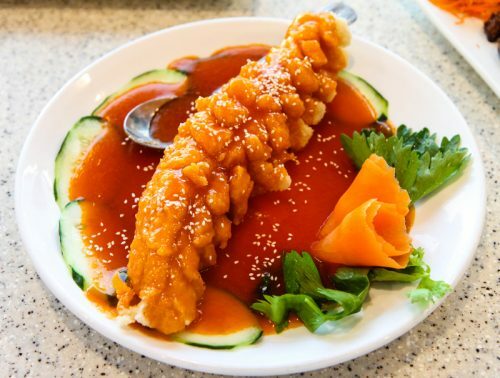 It’s similar to the orange sauce you’ll find in many Chinese restaurants but less thick and sweet and more memorable in flavor. The flounder is cut nearly all the way through and then battered to create maximum crunch coverage while maintaining its shape. At the ends, you’ll get almost all batter but the closer in you go, the fluffier white fish you’ll find. There’s quite a lot toward the middle! Friend #1’s eyes went wide as Eddie pointed out the fried chicken with dried chili on the Sichuan menu, so I knew we were picking that dish. Eddie explained that they get really large wings and cut them in half. I love hot chicken done in this style: a dry fry surrounded by hot chiles and/or peppercorns to create a great, lingering tingle of spice on the lips and tongue. It’s healthier than saucing wings up by a longshot, and Golden Garlic offers a great take. 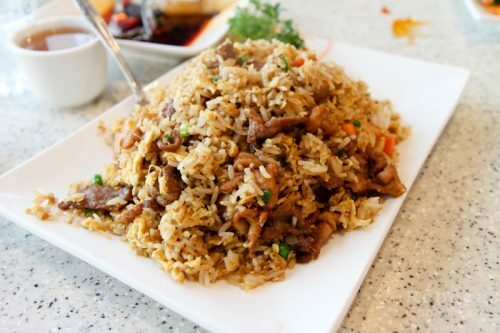 We went more traditional–well, traditional for American Chinese food diners–with Tianjin-style fried rice. But even that familiar dish showed the thought and quality offered by Golden Garlic as the chunks of pork, beef, shrimp, and fried egg were much larger than typically found. The flavors blended nicely, no greasiness to be seen or tasted. 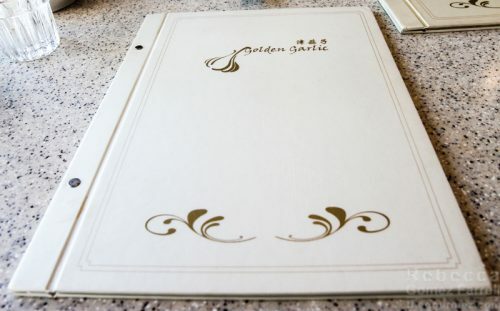 The thoughtfulness that goes into Golden Garlic’s cuisine is also reflected in the restaurant itself. Diners can take their leftovers home in customized reusable bags, and the restaurant is an appealingly casual combination of bright purple booths and baby blue walls with red and white accents. 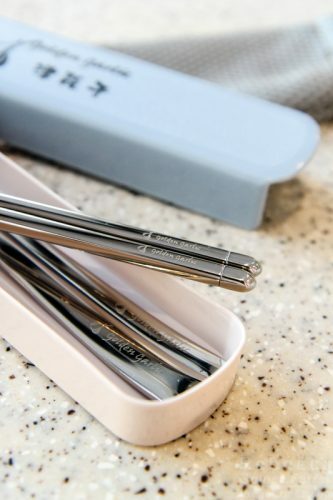 Most thoughtful of all is the engraved flatware settings offered to children as wooden chopsticks can be choking hazards. Come for the food and come again to support a restaurateur who’s excited about the unique qualities Golden Garlic brings to the Bay Area’s table.